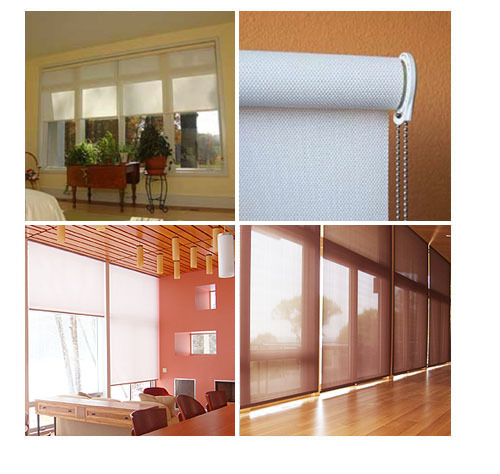 Featuring the lowest emitting, most environmentally sustainable fabrics in the world, Safe Shades™ roller shades are simply the best choice for great looking, money saving, superior solar, privacy, and light control. CHILD SAFE spring roller, Precision Clutch roller, or Motorized roller operation (low EMF) make this collection the ideal choice for intelligent residential applications and demanding commercial installations. PVC FREE-HALOGEN FREE-Commercial Grade-Recyclable available fire-retardant. SafeTech™ SPRING ROLLER: Institutional or "school" grade hardware make these the most affordable, extremely durable, "greenest" shading solution in the industry. With no operating cords these shades are the safest option when a CHILD SAFE SHADING option is paramount. Use with our Exclusive RL light control fabrics, mounted behind our exclusive chemical free roman shades for the ultimate in control and design aesthetic. SafeTech™ CLUTCH ROLLER: Fabric rolls up on a petite tube. A safe continuous chain offers precision control without reaching or bending as may be the case with SafeTech Spring Roller. Also available with chemical free HappyFabrics™ Persian Peace, Malaysian Milk, Winter Lotus, Prairie Mat, Malaysian Moss, or Ginger Grass for an additional charge in addition to the many choices of Safe Shade Fabrics (link below). SafeTech™ MOTORIZATION TECHNOLOGY: Fully automated solar or grid powered roller shades utilizing the latest commercial grade, limited EMF (electro-magnetic-field) integrated motors. Energy efficient radio frequency controls reflect the ultimate in convenient, reliable, and flexible functionality. Control options may include hand-held remote, wire-less wall switch, programmable timer, sun-sensor, personal computer, or even via "App". Many configurations may not require additional electrician services.